A two-day children’s film bonanza organized by the Children’s Film Society of India (CFSI) under the Ministry of Information and Broadcasting, began at a hotel in Naharlagun on Thursday. The show is in collaboration with the State Department of Information and Public Relations. In his inaugural address, I&PR Minister and government spokesperson Bamang Felix appreciated CFSI administrative officer Rajesh Gohil for conducting the film bonanza and said the collaboration of CFSI and IPR would help in screening meaningful films for school children. The minister advised the children to watch and follow only the good, educative and morally enriching films, adding that films influenced the human mind and the society at large. He told the school children to take full advantage of the show and take life’s lessons from the beautiful films on an entire gamut of issues that would be screened for two days. Felix told the gathering that children could change the course of history by dint of their hard work and imagination and narrated the daring and inspiring story of Pakistani girl Malala Yousafzai who surmounted all hurdles to get education. 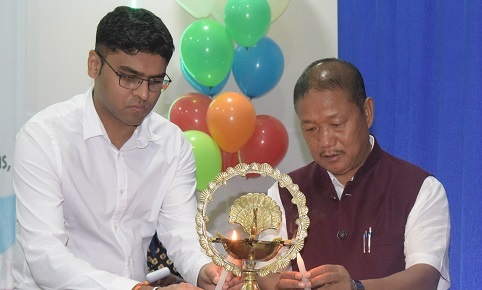 He also said that the Arunachal Film and Television Institute started functioning in the State to facilitate aspiring film-makers and actors in the State. School children from across the twin capital have been invited to enjoy the films in the morning and afternoon sessions. Films for the visually and hearing-impaired students of Dony-Polo School, Itanagar would be screened on Friday.